NON-COMMITTAL I stood on the edge. Before me the abyss. A bottomless (?) gaping black chasm. Hordes of people rushed passed me, stepping into the unknown without hesitation, disappearing from view. My hesitance irritated them. If they weren’t too busy to look, they shot me glares, that wouldn’t have been out of place in a traffic jam, in a queue, after someone had insulted them. I had said nothing. Done nothing. That was their issue. Why couldn’t I just step over the edge? Everyone else was. With smiles on their faces. Breaking from walking pace to light sprint. I couldn’t decide if it was idiocy or courage that made them so unfaltering. Children, men and women, all did what I seemingly could not. Looking either way, along the edge where I was marooned by indecision, I was consoled by the presence of other hesitants, although we shared a look of embarrassment, knowing we we inferior, and the longer we stood, we advertised that fact for all others to see. A tall man in a bowler hat and suit stopped next to me, fresh faced, briefcase in hand. “You can’t stay here forever!” he said looking down at me. As stampedes of people vanished over the precipice I looked up at him. “What’s at the bottom?” I asked apprehensively, surprised by his act of compassion, as bodies brushed passed me making it difficult to keep my balance. Calm, he took his time answering, as onrushing people seemingly bounced off him. “You won’t know until you step off the edge. The only way to know for certain, is by walking into the void.” He readied himself to leave, switching hands on the briefcase, then added, “Don’t follow me. Go when you’re ready.” Smiling as he tipped his hat, I watched as he merged into the masses and just like that, he was gone. I felt braver, and looked across again, noticing some people as hesitant as I was – am – had gone, their fears overcome. I tried to rationalise the process. Everyone else was doing it. Whatever lay at the bottom of the abyss, was surely nothing terrible?! My feet moved closer. Inches away. People swarmed around me, there one second, in a pool of darkness the next. My instincts pulled me back, but my curiosity overpowered them. I couldn’t wait any longer. 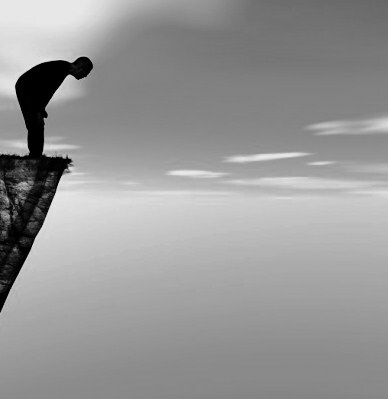 I launched myself over the edge, falling, seemingly alone. And as I fell, I thought to myself, didn’t curiosity kill the cat? It was a huge relief when my next thought was, I am not a cat. I love when something captures my mind and I can’t take a breath til I finish reading! I am a little blue in the face, grin. I sometimes wish there were multiple LIKE buttons, grin. Haha, that’d be handy! Or a super like button? Even better! Love your way of thinking! Well written because I couldn’t wait to see what would happen. Last line was fun!